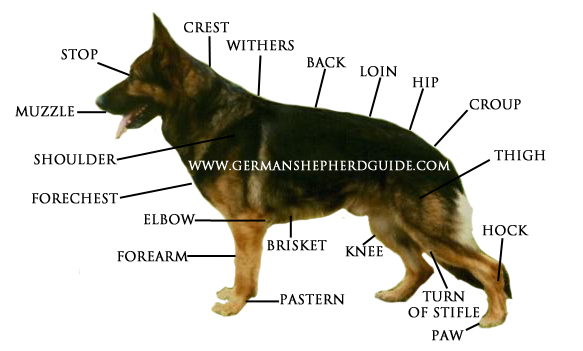 A German Shepherd Dog is a trotting dog, and its structure has been developed to meet the requirements of its work. General Impression-- The gait is outreaching, elastic, seemingly without effort, smooth and rhythmic, covering the maximum amount of ground with the minimum number of steps. At a walk it covers a great deal of ground, with long stride of both hind legs and forelegs. At a trot the dog covers still more ground with even longer stride, and moves powerfully but easily, with coordination and balance so that the gait appears to be the steady motion of a well-lubricated machine. The feet travel close to the ground on both forward reach and backward push. In order to achieve ideal movement of this kind, there must be good muscular development and ligamentation. The hindquarters deliver, through the back, a powerful forward thrust which slightly lifts the whole animal and drives the body forward. Reaching far under, and passing the imprint left by the front foot, the hind foot takes hold of the ground; then hock, stifle and upper thigh come into play and sweep back, the stroke of the hind leg finishing with the foot still close to the ground in a smooth follow-through. The overreach of the hindquarter usually necessitates one hind foot passing outside and the other hind foot passing inside the track of the forefeet, and such action is not faulty unless the locomotion is crabwise with the dogs body sideways out of the normal straight line. Content Copyright to the American Kennel Club. All Rights Reserved.